Renata Buziak: Afterimage publication, Essay: Dr Victoria Garnons-Williams. Available form selected book stores, and the artist (please go to contact page). Renata Buziak, Biochromes: A Visual Metaphor for the Transformative Action of Medicinal Plants in Building Sustainability with the Arts. Proceedings of the 2nd National EcoArts Australis Conference. Edited by David Curtis, Cambridge Scholars Publishing, 2017, pp. 329-348. Renata Buziak, Art, healing and local medicinal plants of Minjerribah (North Stradbroke Island) in Brisbane Diseased: Contagions, Cures and Controversies. Edited by Alana Piper, Brisbane: Brisbane History Group and Boolarong Press, 2016, pp. 193-213. Renata Buziak, Biochromes and Healing Plants: Transdisciplinary Studio Research, Studio Research Journal, Issue #2, July 2014, pp.44-55 (pdf). Renata Buziak, Biochromes: Perceptions of Australian Medicinal Plants through Experimental Photography, PhD Exegesis, Queensland College of Art, Griffith University, September 2015. Medicinal Plant Cycles, GUP Magazine, #55, the Wonder Issue, November 2017, pp. 118-129. Renata Buziak Self-Portraiture from the Solitary Performance , Louise Martin-Chew, Onespace Gallery reveal exhibition catalogue, September 2017. Nature Continually Ablaze: Renata Buziak’s Medicinal Plant Cycles@ Gaffa Gallery, Daniel Pateman, Exhibition Review, London Photography Diary, March 2017, and in Eyeline magazine, #87, Nov 2017. Renata Buziak: Unfolding Rhythms II, Carol Schwarzman, Exhibition Review, Artlink, July 2016. Knowing and Knowledge: The Interdisciplinary Research of Visual Artist Renata Buziak, Dr Victoria Cooper, Medicinal Plant Cycle exhibition catalogue, October 2015. Habitat: Artworks and Stories of Pine Rivers Gardens, Gordon Craig, Exhibition review, Lucida, 19 August 2015. Presence and Boundaries, Dr Stephen Hobson, Habitat exhibition catalogue, June 2015. The Absolute Authority of Authenticity, Simon Marsh, Panoptic Press, Jan 2015. Artist Talk on YouTube, Panoptic Press, Jan 2015. Unfolding Rhythms, Common Ground, Issue Two Nature/Next, Dec 2014. Ogród (The Garden), Louise Martin-Chew, Hayward Fine Art exhibition catalogue, 31 October 2014. Preserving the beauty in decay, Plant curator, 16 October 2014. 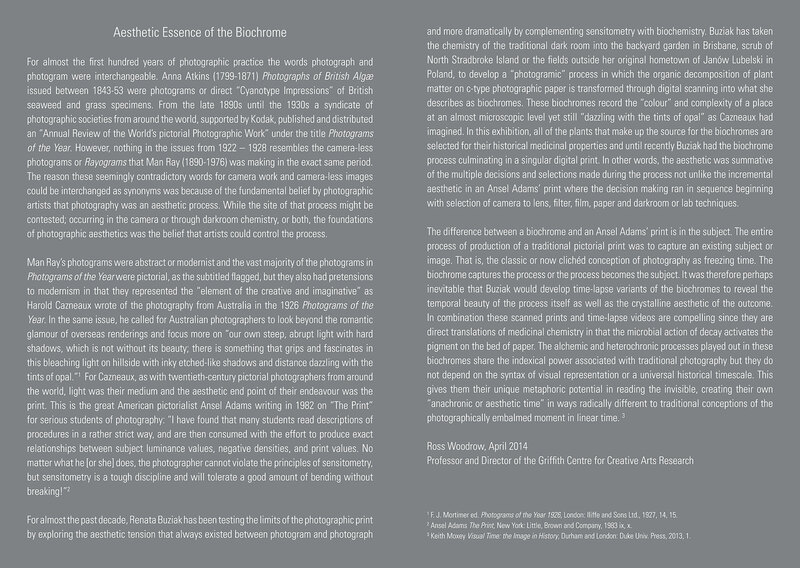 Aesthetic Essence of the Biochromes, Prof Ross Woodrow, Unfolding Rhythms exhibition catalogue, April 2014. 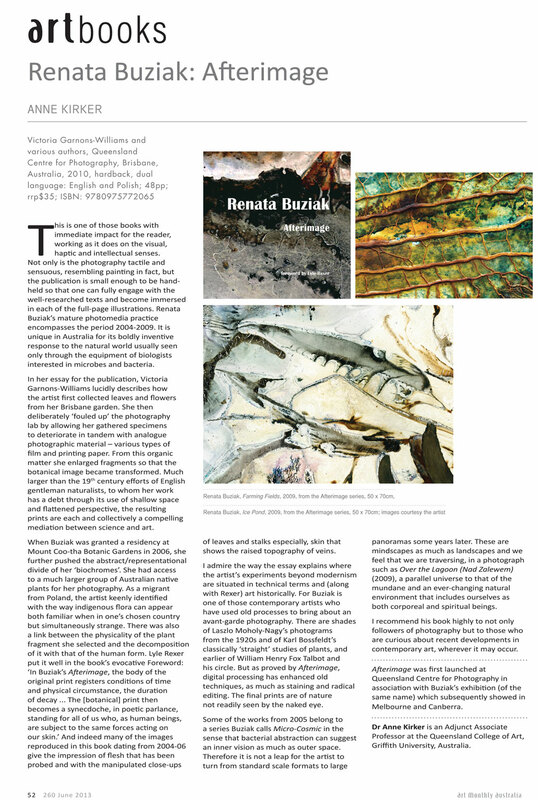 Renata Buziak Afterimage, Dr Anne Kirker, Book Review, Art Monthly, June 2013, p. 52.
exhibition review: renata buziak’s ‘afterimage’ , Vanessa Wright, Lip Magazine, 24 May 2013. Renata Buziak – Afterimage: how memories decompose, Assoc. Prof. Marian Drew, Art Almanac, 30 April 2013. Renata Buziak Afterimage, Unless you will (UYW), Issue 24, January 2013, pp. 116-137. Renata Buziak: ABSENCE by Melissa Amore QCP Exhibition Catalogue 2011. Renata Buziak Marine Cove, AUSTRALIAN PHOTOGRAPHY AND GALLERY COMPENDIUM (pdf), Dr Judy Anderson, Daylight Productions, 2011, pp. 88-89. Biochromy Renaty Buziak by Krzysztof. Bajkowski '' (in Polish), Boomerang Polski, 2011. 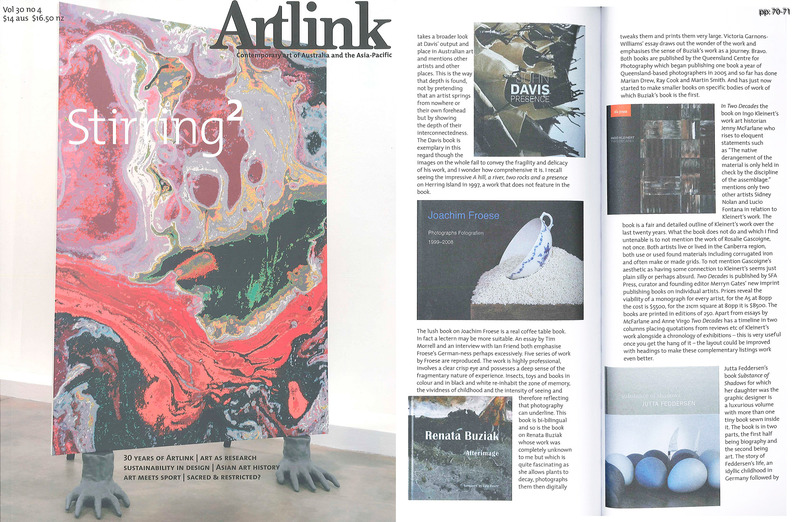 Artlink, S. Radok, Vol 30 No 4, pp. 70-71, PDF. Renata Buziak: Me and the Microbes by Steve Packer, pdf , Issue 46, Dec 2010-Feb 2011, pp. 24-30, Photo Review Australia. Vivienne Kelly & Renata Buziak Untamed Gardens by Dr J. Anderson, Spring 2010, p. 44, Independent Press. Afterimage Review by Rebecca Smith LUCIDA Magazine, 2010. GNN by Tony Preece 29 June 2009, Movers and Shakers. Magic, Naturally by Tony Preece 22 Sept 2008, News in Brief. string(44) "Smarty error: [plugin] unable to fetch: (6)"